We are part of the Butterfly Scheme and welcome carers as our partners in care, encouraging open visiting for patients with dementia. We recognise the important role families and carers can play in helping to improve patients’ wellbeing and experience. All our adult inpatient wards are open between 11am and 8pm. We are part of the Butterfly Scheme and welcome carers as our partners in care, encouraging open visiting for patients with dementia. The Butterfly Scheme helps people who are in hospital and who find it hard to remember everything that’s going on. Hospitals can be busy places and we know that can feel overwhelming at times. Over 150 hospitals across the UK and Ireland have the Butterfly Scheme. The scheme teaches staff how to help people who need memory support whilst they’re in hospital. Some people will have a diagnosis of dementia, but others will simply need some memory support whilst they’re unwell. If you opt into the scheme, a discreet Butterfly symbol is used to let staff know the sort of help to offer. You can also fill in a sheet giving information to help staff tailor their care to the individual. Barnsley Hospital has the Butterfly Scheme, so please ask a member of staff if you’d like to consider using it; patients, their families or carers can request it. The opt-in process is extremely simple and there is no charge. There are Butterfly Scheme Champions throughout the hospital. For the right of people with dementia to be supported by their carers in hospital. 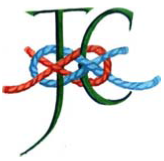 John’s Campaign was founded in November 2014 by Nicci Gerrard and Julia Jones. Behind its simple statement of purpose lies the belief that carers should not just be allowed but should be welcomed, and that a collaboration between the patients and all connected with them is crucial to their health and their well-being. We will try to help you understand the out-patient process and support you to ask questions that are important to you. We will try to arrange times to suit your needs. We can assist you with accessing the Butterfly Scheme. We can offer information to access services available both within the hospital and community. We can provide a quiet area to wait. We can provide books and items to pass time whilst waiting if required. We are committed to John’s campaign to ensure that carers are welcome at all times. If you need to change your appointment we need to know from you when your appointment is. Please do talk to us about anything that concerns you so that we can help. If you require any assistance at anytime during your appointment please speak to a member of staff. Make sure you have the things with you that help with communication, glasses, hearing aid. If you would like somewhere quiet to wait let us knew when you arrive in department. Please feel free to bring with you anything that makes you feel secure and comfortable. Bring with you your completed Reach out to Me care sheet. 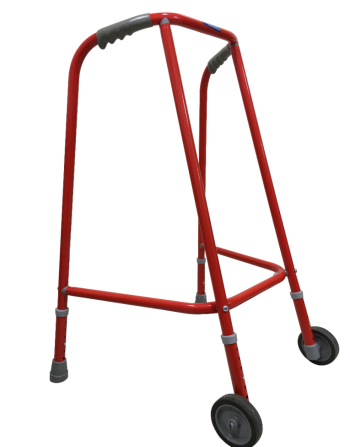 The Physiotherapy team use red zimmer frames in the hospital. Bright colours are used to highlight important objects and promote a dementia friendly environment. 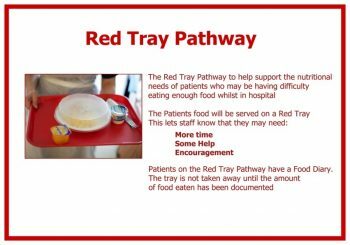 We have a number of initiatives throughout the Trust to help us to ensure patients dietary needs are met. Red jugs, trays, cups and more are used to indicate a patient may need additional support and monitoring around eating and drinking. 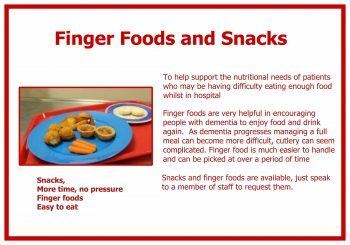 Barnsley Hospital provide a hostess delivery service to patients on wards. Hostess staff take patient food orders, ensuring patients receive their meals ordered on the same day and no more than one meal in advance. Hostesses are able to explain meal choices to patients with pictorial representations of the meals on offer. Food is plated at ward level offering the opportunity for appropriate portion sizes per patient. This ensures that food remains at the correct temperature until served. If you are a relative or carer assisting a patient with their meal, or you are with a patient who is supported with MyCarePlan (for last days of life), you are eligible to purchase a discounted carer’s meal to eat on the ward. 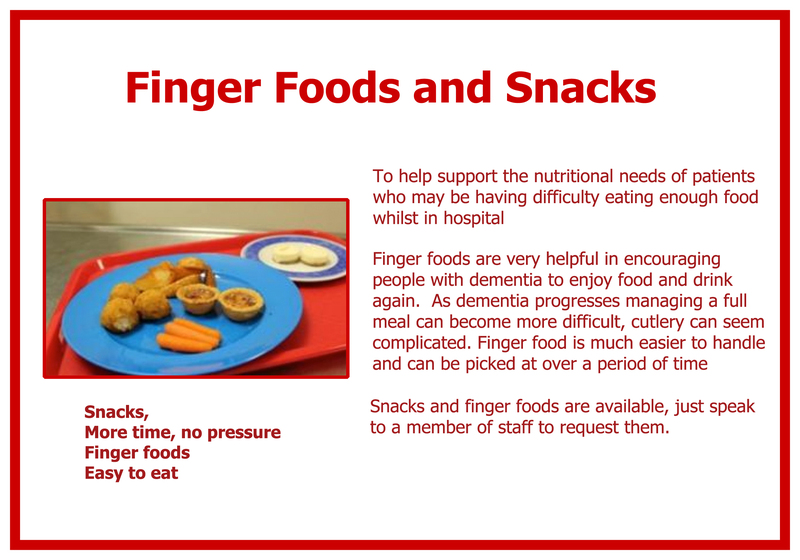 For today’s carer’s meal option and to order your meal please speak to the ward hostess. 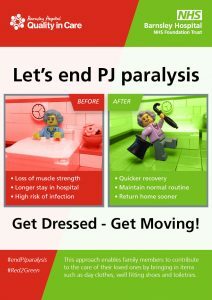 At Barnsley Hospital we support ending Pyjama Paralysis. 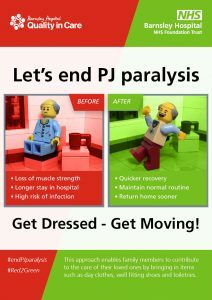 This is a national campaign devised by Cambridge Digital Health and supported by Professor Jane Cummings, Chief Nursing Officer for England which aims to get patients up, dressed and moving while in hospital! We want to help get older people back home to their loved ones living much happier and fuller lives. Making the most of valuable patient time is particularly important – as figures show nearly half of people aged over 85 die within one year of a hospital admission. 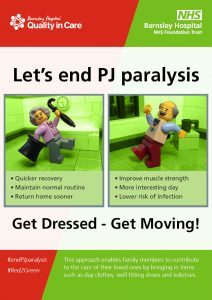 We want to get as many patients up, dressed and moving as possible – proven to assist in reducing length of stay. Bedbound patients lose 1 – 5% of their muscle strength every day they are in bed, they can also develop skin breakdown, pressure sores, confusion and fatigue. 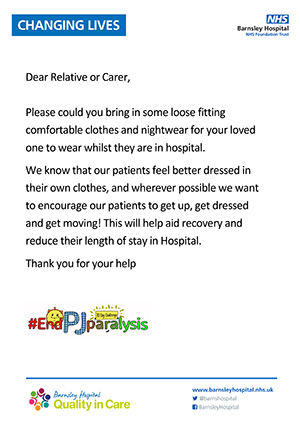 So to help support getting as many patients up, dressed and moving as possible we ask patients to bring in loose fitting comfortable clothes as well as nightwear for their stay in hospital. You’ll see these posters up in and around the hospital. The Red Bag and its contents are transferred with the care home resident on their journey from the care home in the ambulance to the hospital and back again. 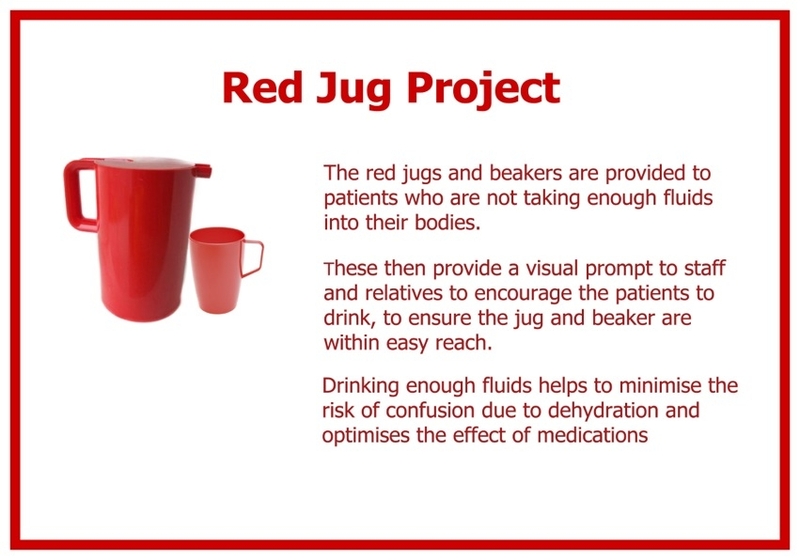 The aim is to improve the care and experience of the patient or resident by ensuring all their information, medication and personal belongings are inside the Red Bag and transferred effectively between locations. When a resident needs to go into hospital, care home staff will pack the bag with personal documentation, medication and personal belongings e.g. Glasses/Hearing Aids. The bag is handed to the ambulance staff who will pass it to the hospital staff on arrival. 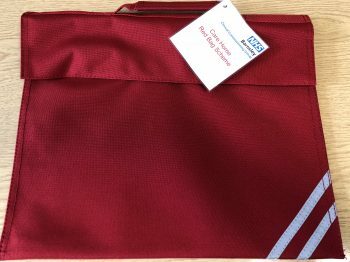 The Red Bag provides nurses and doctors with up-to-date information about the patient, meaning fewer calls to the care home, and easier interaction with the patient. The same process is repeated with up-to-date documentation when the resident is ready to return home. More about the Red Bag Scheme. Dementia Friendly Barnsley is a webpage where you can find events and activities, as well as information, support and services for people living with dementia in Barnsley. You can find your local GP Dementia Champion near the bottom of the homepage. South Yorkshire Dementia Action Alliances (SYDAA) is an umbrella structure bringing together the four local Dementia Action Alliances (Barnsley, Doncaster, Rotherham and Sheffield) and South Yorkshire Fire and Rescue (SYFR) to work in partnership and deliver the Dementia Fire and Home Safety Project. 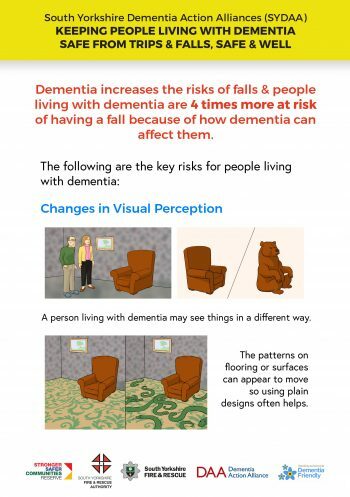 This video follows Sue & Pete (daughter & dad) and shows the main risks of falls posed to Pete on his journey with dementia and provides solutions to help to reduce the likelihood of a fall. 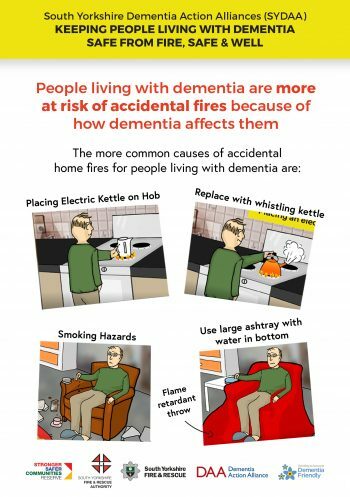 This video provides dementia specific safe from fire information including how to get a free home safety check. 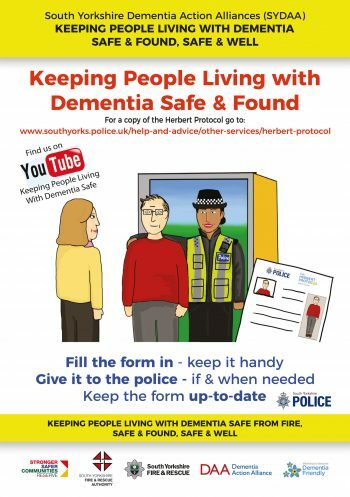 This video provides information about how the Herbert Protocol can help if a person living with dementia goes missing. For more information about the subjects raised in these videos visit the South Yorkshire Dementia Action Alliances website.